Write the fraction as a percent. Write the mixed number as a percent. Write the decimal as a percent. About 0.47 of the animals in a pet store were dogs. Write this decimal as a percent. Write three different proper fractions that are greater than 78%. Extended Response The percent of a wall covered by the mural painted by each grade is shown. a. Write the percents as fractions in simplest form. b. About how many times larger is the 6th grade mural than the 8th grade mural? c. Compared to the 8th grade mural, is the 6th grade mural in the figure the correct size? Explain your reasoning. Extended Response Students in a grade were asked to tell their favorite subject. a. 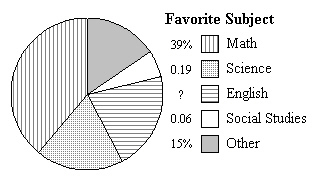 What percent said math, science, or social studies? b. How many times more students said math than social studies? c. What percent said English? Write this percent as a decimal.